American wrought iron free standing fire screen with flanking ball finials, decorative scrolled centered panel with interior lined mesh, tapered supporting columns, and terminating on scrolled legs with stylized penny feet, Early 19th Century. American wrought iron and brass rail nursery fire place screen with connecting swags and pleasing artistic scrolled wire work, New York, Early 19th century. American artistic wire work fire place fender with a brass rail top, centered iron supports, and the original three turned bulbous ringed finials, Early 19th century. This fire place screen is made of brass and iron. This is an Arts & Crafts work, circa 1900. 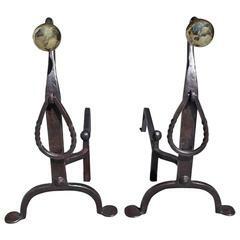 Bronze and iron fire place tools, French, circa 1970. 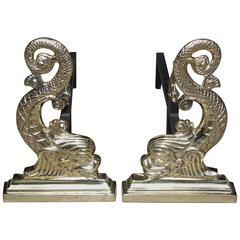 This fire place screen in the neoclassical style is made of brass with a steel grilling. The quality is really good, this is a French work, circa 1970. This fire place screen is made of brass and grilling. The sides can be folded for the fire place to be almost flat or to be more or less wide. This is a French work, circa 1970. This fire place screen is made of brass and metal grilling. It is very simple. This is a French work, circa 1970.